This year my tree to study is the Crataegus mollis, or that is what I currently believe it to be. The common name for Crataegus mollis is downy hawthorn or down hawthorn. I will refer to it as hawthorn. My hawthorn is a puny spindly tree. I will make observations about the tree and about the things that affect the tree. My hawthorn is at the edge of the woods behind my husband's shop. I did not plant it and as far as I know, it is a native plant. Today during a walk in the woods, I found another one, a younger one, about 50 feet west of my hawthorn. I call it mine not because it is on my property but because I want to learn more about it. I find it a particularly interesting tree and always have since moving here 18 years ago. It has a distinguishing feature that most of my other trees do not have. Thorns - there are lots of long thorns on the trunk and on all of the branches. The thorn pictured here is a young thorn and 1.25 inches long. The older branch thorns are close to 2 inches long. The thorns on the trunk are compound thorns, several thorns branch out from one center thorn. The center thorn is around 3 inches long. During my walk, I took one sample cutting from my hawthorn. The sample is composed of last year's growth and two-year old growth. The cutting contained a spray of blooms and they are on the older wood. While I had the branch pulled down, I noticed a dark sinister looking bug on one of the leaves. Upon closer inspection, I saw that it was an aphid lion, the larvae of the ladybug. Of course, while I was looking at the aphid lion, I noticed that my hawthorn is home to hundreds of aphids. Aphid lions prey on aphids, which seems easy for them because they are a lot bigger than the aphids. Aphids are quite a pest but they are interesting. They reproduce in vast numbers - similar to the amount produced by queen termites, queen bees, or queen ants. The life cycle and reproduction is quite remarkable. Wingless female aphids hatch from eggs that were laid in the previous season by fertilized winged females. The wingless females then give birth to live wingless females via parthenogenesis (male aphids not necessary for this stage) and those do the same, creating generation after generation of wingless females. Later, when the host plant is crowded, the wingless females give birth to winged females which fly away to find another host plant and they give birth to wingless females by parthenogenesis. When autumn nears, they will give birth to winged males and winged females. From these, there will be fertilized eggs laid which will over winter. Some aphids are tended and protected all winter and then brought out and placed on host plants by ants. Aphids excrete a substance called honeydew. Ants cultivate and rear the aphids, "ant cows," like domestic animals for this honeydew. The ants will defend the aphids as well. Three years ago, aphids were all over my okra blossoms and large ants were tending them. The okra plants also had many aphid lions, and occasionally, the ants would gang up on an aphid lion and kill it. I have learned that bees sometimes gather the honeydew and make honey. Decades ago, manufacturers sweetened cookies and bakery goods with "honeydew honey". This was before corn syrup became the new cheap sugar. If ants or bees do not gather honeydew, the honeydew acts as a food source for a group of fungi known as sooty molds. 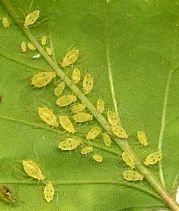 The aphids weaken plants in the first place, then some plants will also get covered with sooty mold which can hamper photosynthesis and we all know what that does to a plant. Aphids consume plants by drawing plant sap and juices through their piercing mouth tube. It looks like a tube and I've seen this mouth tube referred to as "a long rostrum ensheathing the mouth-parts" or stylets or even a proboscis. Aphids can transmit plant diseases as they go from leaf to leaf. This aphid is belly-up. Did you know that aphids have a difficult time up righting themselves if belly-up? I watched one struggle to turn itself upright and it did not succeed. It eventually stopped trying. It tried to use its long antennae and failed. The aphid is so round that kicking its legs was futile. Perhaps a younger, less round aphid would have managed. Aphids come in many colors and are sometimes called green flies or plant lice. They have long antennae, long legs, two-joined tarsi with paired claws. In the image above, you can see its two eyes and the dark dot which is the end of its mouth-part. 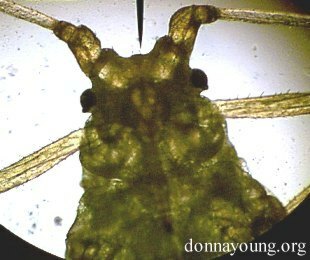 In this image, you see the aphid's face, her two eyes, antennae, and hanging down from her face is the mouth tube. Image information: The upper 2nd-4th images were made with my scanner or camera. The uppermost image and the last three images were made with my digital camera paired with my microscope. 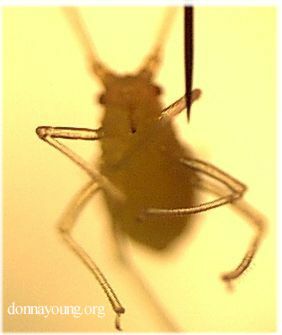 This image shows the side of the aphid. 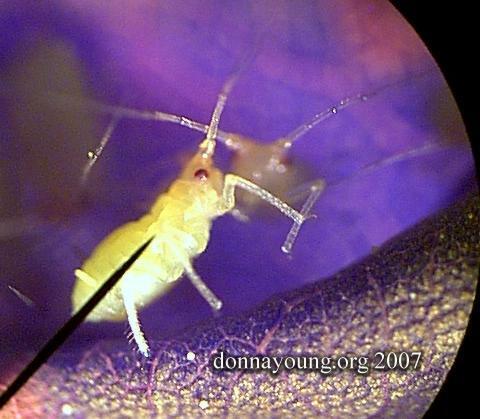 Look toward the backside of the aphid and you will notice a tube. 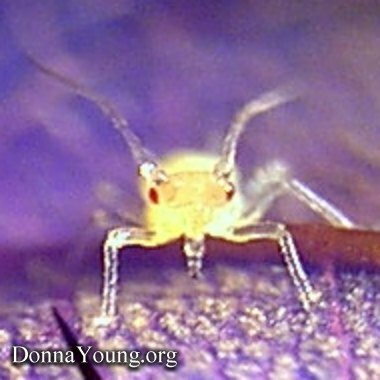 The aphid has two of the tubes, one behind each of the aphid's back legs. The aphid can ooze a waxy substance from the tube for defense purposes. I suppose it slows down the predator for a few seconds. I have not learned if the waxy substance from the aphid has any other uses. Q: What is the pointy thing in your microscope pictues? A: That is a pointer that is built into my microscope. Q: What sort of microscope do you have? A: I have the National Optical Microscope #131. Q: Are all aphids yellow? A: No, there are over 4,000 species of aphids and they come in several colors.